How is SmartrapCore XL300 bed connected to the linear bearings? Hi guys, I've seen this new printer from our friendz and I can't really tell how are the bed aluminum profiles connected to the linear bearings. From what I can tell there is a drilled larger hole in the extrusion and they are press-fitted in that hole? Or is there a mechanism to actually clamp those bearings... . Moreover, is there a single longer bearing or are there two smaller or just one small (normal)? Re: How is SmartrapCore XL300 bed connected to the linear bearings? I think I know, albeit not having any feedback. I kinda expected a close-up picture but well... I think I can see a "set-screw" going through the centre of the alu profile towards the bearing, which I again guess is a single longer bearing that I've seen around for some time. Nonetheless I find this solution brilliant. It's just not something one can do at home with a handheld drilling machine. Whilst this might be a clever way of attaching the bearings, overall the z axis looks like it might be hard work to get good motion from. Dual z motors, belts and 4 smooth rods to align. My smartrapcore alu has a wobbly but very usable z axis so perhaps this one works better than I expect it too. Prusa has two motors on Z since forever and they seem to manage ok so I don't think this will be less reliable. Aligning 4 rods could be problematic but not impossible. I would put the bed together and would hold it somehow at the topmost position, clamp the rods there, then let it fall until it gets to the bottom. The bed will keep the rods vertical so fasten at the bottom side and that's it. But this is just a guess...until somebody does it on video or shares his experience how he does it we're just speculating. so I received my Smartrapcore XL300 Kit from smartfriendz yesterday and hope to get it running soon. The bearings for the Z axis are held in place with tiny set-screws. Not only the bearings used in the Z axis but all bearings used are longer ones. I think they are double the length of the standard lm8uu. For now the Documentation isn't as complete as I wish it would. But with some peeking at the Onshape files it should be ok.
To be honest this is my first kit printer ever and I'm not an engineer. Additionally I'm not finished with building it so I can't judge it by now. In the process of building I cracked a few pieces because I made some dumb mistakes and the parts that were delivered only have a very small amount of infill and some have a little problem with z-bonding. But I wanted to replace the printed parts with abs ones anyway and a friend of mine is kind enough to print them. They should be finished next Monday or so. So I still think that those long bearings are a little overkill and that you could get away with the short ones. I have a bunch of lm8uu type igus bearings laying around that I Initially wanted to use so probably I'll try them and keep you updated. But so far it was a pretty easy build and aligning the rods wasn't as difficult as I expected ( I fastened the bottom screws after measuring the distance to the front. Fastened the top while a friend held the bed in the top position) but to really see if they're aligned properly I need to print some stuff. Edited 1 time(s). Last edit at 04/28/2016 11:15AM by kalamaraki. Are the rods 8mm or more ? Still haven't got the ABS parts I was hoping for, but i got the printer working and I'll post some kind of review of the whole kit experience next weekend. A really big thanks to realthor and DjDemonD for all your documentation in this thread. It helped a LOT! As for the longer bearings: I noticed that the bearings on the Z axis have some play when moved by hand but when lifted by the motors the bed rises equally and in combination with the auto bed levelling/tramming procedure I always get a really good first layer. Imho smartfriendz use the longer bearings in Z because they're using those as well for XY and it's probably cheaper getting them in bulk than sourcing additional shorter ones for Z only. I ran into several problems with mine due to the fact that I'm totally inexperienced with reprap kit's except for a quick look at nopheads mendel 90 which a friend has. - broke an arm that holds one of the gt belts because the tolerances were to tight and I had to force it in even after cleaning the edges. but these are all minor things that are mostly related to user error and perhaps the amount of documentation provided by smartfriendz. The mechanical assembly was easy as pie because they shipped partially assembled parts and most of the things are well thought out. Assembly ended to be fast and everything was pretty square/straight at the end. Build volume on this is pretty amazing for me because I need to print bigger parts on a regular basis. I can already pull of some decent prints and I'm now trying to dial in the printer as best as I can. (Will post fotos on the weekend). 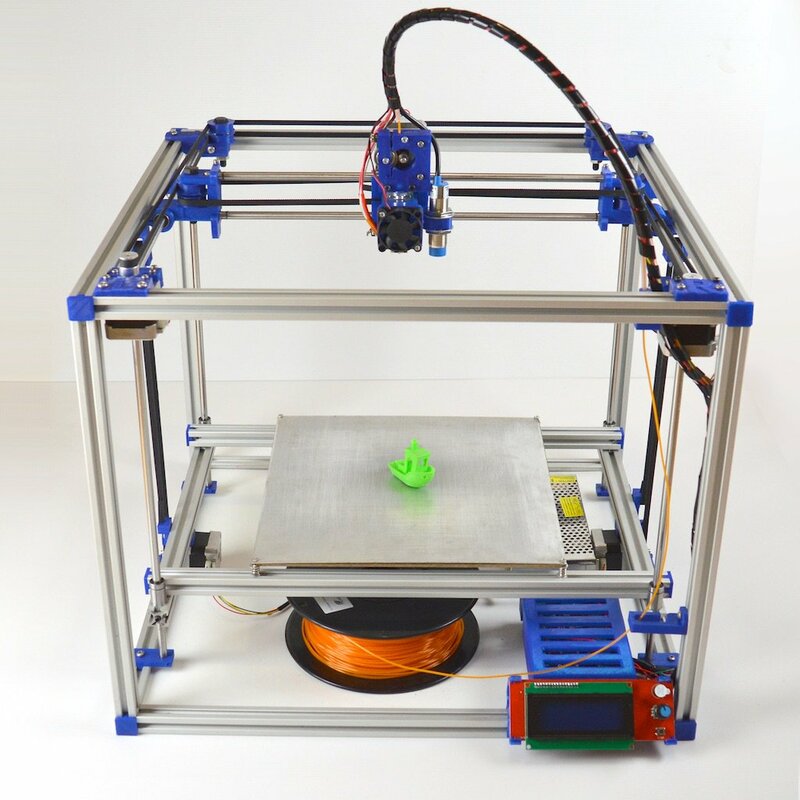 In my opinion you get a really good printer thats truly open source & thats really easy to modify and will therefor "grow" with your own needs and level of skills. Additionally there is an active community that has already contributed lots of good stuff to this project. Only thing I would consider if I were you is the build volume. I think most of the users especially the normal / first printer types won't need that much volume in 95% of the time and it seems pretty easy to change your build volume even if you already have one. So if you're tight on budget and you want to mod a lot anyway maybe the normal one + an e3d hotend or a pi with octoprint or abs parts from 3d hubs might be a better starting point but that depends on your personal needs and preferences. I personally would go the same route again though. Edited 1 time(s). Last edit at 05/10/2016 02:29PM by kalamaraki. Yes, thank you, i think i'll go for the xl300, i don't NEED a bigger print volume, but i'll need it, i will have one. The standard PLA parts are not brilliant. PLA isn't the ideal material for machine parts, its too brittle and the fine details are sometimes not fine enough, like belt clips. Yes on my SCALU the heated bed wiring supplied was woefully inadequate, I am now using proper cables and 24v, so no problem now. This is always a good thing, its better to understand how to set it up than rely on preconfigured firmware which is often not perfect, and won't be exactly specific to your machine. Check the contrast potentiometer on the back isn't in need of adjustment but this might be related to the problem below. The arduino units both myself and Altheimer were supplied both blew the voltage regulators, so they will only power when connected to 5v. In the end I replaced the arduino and ramps (as the supplied version had the microstepping jumpers shorted on the PCB meaning I was stuck on 16x, when I needed (4/8x). I did get replacements from Smartfriendz. All this being said I am certain that had a bought a kit from the far east I would have had many more problems. And this is how you learn it all. Hope its all good now. I just want to apologize about our first xl300 lot shipped recently. We have had lot of problems due to young design , and maybe too soon release of the model. We are working hard to improve the model, the doc, our delivery time and production quality. I noticed there was NOT much negative comments ( even not at all in fact ) about this production .I'm always surprised how nice and supportive is the reprap community ! I'm not sure i would be so gentle with missed parts, or bad documentation..
so thank you all we are going forward to make this model really better and i hope a bigger one soon ?